The project was coming along well until I got stuck needing to clearly explain what it means to ‘find your voice’ as it relates to personal development. If you read back in my blogs, I actually thought I had done that just a week ago. Yet, I was only half right. I knew what it meant intrinsically, I knew I had experienced occasions where I ‘found my voice’, but I could not put all the parts together to explain it to clearly. 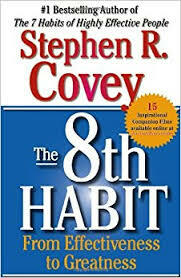 Then I came across Stephen Covey’s 2004 book, The 8th Habit. According to Covey, your voice can be found when your natural strengths are energized to fill a perceived need by following the still, small voice within, which assures you what you are feeling is right, and prompts you into action. (2) It is the integration of our physical, mental, emotional and spiritual intelligences and capacities, which then unleashes your human potential. (3) (p. 60) You are inspired to act and others are inspired by your actions. Seems to me that finding your voice is a habit that should be everyone’s goal. For the record, task-shifting, as I was doing, is not a good thing to do if you want to achieve your goals. Yes, it worked for me this time, but generally it reduces efficiency. Here is the link to a Positive Psychology blog which discusses finding your voice. Here is a link if you are interested in buying Covey’s book.